On February 28th 2019 at the AGM it was proposed from the floor and with a majority vote that the Association would make all waters of the Association Catch and Release for Salmon fishing from 1st October again this year. It was decided that from this date that all salmon caught should be returned carefully to the river using full catch and release practises. Remember that bait fishing is not allowed from the 1st October as it is harder to safely release salmon using this method. Any member caught with a salmon carcass in their possession from the 1st October will be deemed in breach of this regulation and will be suspended from the Club. Dead or alive the salmon must be returned to the river. Loughs Agency rules will apply as per reverse of the permit ie. Angling is permitted only with a single barbless hook with a gape of 12mm or less. From the 1st October the use of earthworms, as bait, is prohibited. Thankfully as the years have progressed we have now many more members practising catch and release so this should not really cause too much of an upset to most. I would like to thank all these members for being proactive in protecting salmon for the years ahead. We are complying with the majority of members feelings who attended the AGM in Feb 2019. Don’t forget if you kill a salmon then you are denying this fish the possibility of spawning which in turn will only help decline salmon numbers for future generations. Please see catch and release information below. Any member found with a salmon after this date will face suspension from the AssociationHopefully this will help. 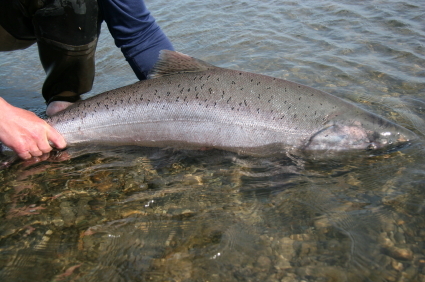 The angling method used can have a significant bearing on the survival rate of released salmon Anglers intent on releasing fish, or anglers fishing waters where a catch and release rule is in force. should carefully consider the angling method used. 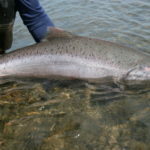 Salmon caught by fly fishing using single barbless hooks, have a greater chance of survival than fish caught on barbed hooks, hooks or lures with double or treble hooks. Barbless hooks do less damage, are easier to remove and reduce handling time which can be in important factor influencing survival. Barbed hooks can have the barb pinched with a pliers to allow salmon to be released more easily. Where it is not possible to use barbless hooks, hooks used should be single. The fishing tackle used should be strong enough to enable the fish to be brought in quickly. taking account of the prevailing conditions and the possible size of the fish that might be caught. Keep the salmon in the water at all times. Survival rate is greater at water temperatures below 20 C.
Absolutely correct, its good that exact advice is given in the article on how to treat a captured fish.